A transaction is a signed section of data that is broadcast to the network and collected into blocks. It typically references previous transaction(s) and dedicates a certain number of bitcoins from it to one or more new public key(s) (Bitcoin address). It is not encrypted (nothing in Bitcoin is encrypted). A block chain browser is a site where every transaction included within the block chain can be viewed. This is useful for seeing the technical details of transaction in action, and for payment verification purposes. The input in this transaction imports 50 BTC from output #0 in transaction f5d8... Then the output sends 50 BTC to a Bitcoin address (expressed here in hexadecimal 4043... instead of the normal base58). When the recipient wants to spend this money, he will reference output #0 of this transaction in an input of his own transaction. An input is a reference to an output in a different transaction. Multiple inputs are often listed in a transaction. The values of the referenced outputs are added up, and the total is usable in the outputs of this transaction. Previous tx is a hash of a previous transaction. Index is the specific output in the referenced transaction. ScriptSig is the first half of a script (discussed in more detail later). The script contains two components, a signature and a public key. The public key belongs to the redeemer of the output transaction and proves the creator is allowed to redeem the outputs value. The other component is an ECDSA signature over a hash of a simplified version of the transaction. It, combined with the public key, proves the transaction was created by the real owner of the address in question. Various flags define how the transaction is simplified and can be used to create different types of payment. An output contains instructions for sending bitcoins. Value is the number of Satoshi (1 BTC = 100,000,000 Satoshi) that this output will be worth when claimed. ScriptPubKey is the second half of a script (discussed later). There can be more than one output, and they share the combined value of the inputs. Because an output can only ever be referenced by a single input, the entire combined input value needs to be sent in an output if you don't want to lose it. If the input is worth 50 BTC but you only want to send 25 BTC, Bitcoin will create two outputs worth 25 BTC: one to the destination, and one back to you (known as "change", though you send it to yourself). Any input bitcoins not redeemed in an output is considered a transaction fee; whoever generates the block will get it. A sends 100 BTC to C and C generates 50 BTC. C sends 101 BTC to D, and he needs to send himself some change. D sends the 101 BTC to someone else, but they haven't redeemed it yet. Only D's output and C's change are capable of being spent in the current state. To verify that inputs are authorized to collect the values of referenced outputs, Bitcoin uses a custom Forth-like scripting system. The input's scriptSig and the referenced output's scriptPubKey are evaluated (in that order), with scriptPubKey using the values left on the stack by scriptSig. The input is authorized if scriptPubKey returns true. Through the scripting system, the sender can create very complex conditions that people have to meet in order to claim the output's value. For example, it's possible to create an output that can be claimed by anyone without any authorization. It's also possible to require that an input be signed by ten different keys, or be redeemable with a password instead of a key. Bitcoin currently only creates three different scriptSig/scriptPubKey pairs. These are described below. 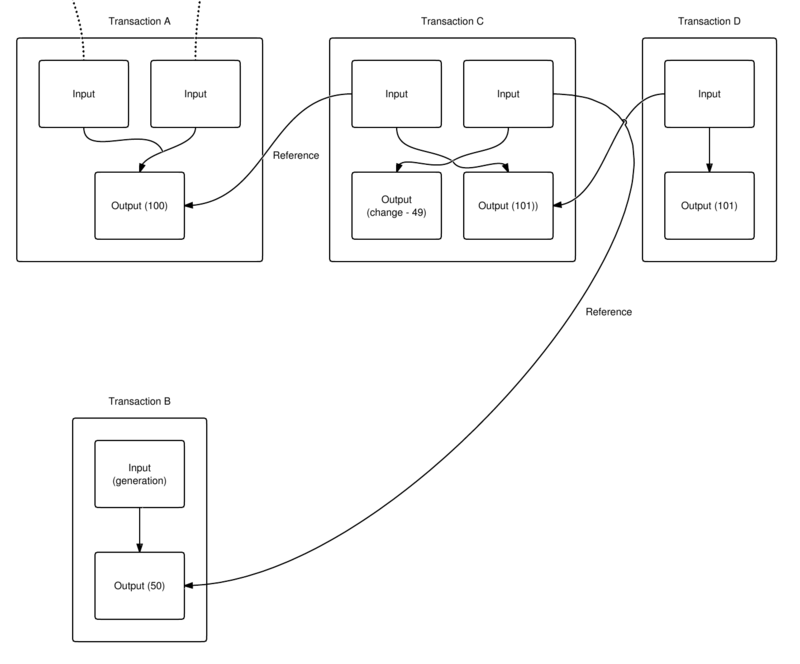 It is possible to design more complex types of transactions, and link them together into cryptographically enforced agreements. These are known as Contracts. The sender gets the public key when talking to the recipient over IP. When redeeming coins that have been sent to an IP address, the recipient provides only a signature. The signature is checked against the public key in scriptPubKey. Empty. <sig> <pubKey> OP_CHECKSIG scriptSig and scriptPubKey are combined. <sig> <pubKey> OP_CHECKSIG Constants are added to the stack. true Empty. Signature is checked for top two stack items. A Bitcoin address is only a hash, so the sender can't provide a full public key in scriptPubKey. When redeeming coins that have been sent to a Bitcoin address, the recipient provides both the signature and the public key. The script verifies that the provided public key does hash to the hash in scriptPubKey, and then it also checks the signature against the public key. Empty. <sig> <pubKey> OP_DUP OP_HASH160 <pubKeyHash> OP_EQUALVERIFY OP_CHECKSIG scriptSig and scriptPubKey are combined. <sig> <pubKey> OP_DUP OP_HASH160 <pubKeyHash> OP_EQUALVERIFY OP_CHECKSIG Constants are added to the stack. <sig> <pubKey> <pubKey> OP_HASH160 <pubKeyHash> OP_EQUALVERIFY OP_CHECKSIG Top stack item is duplicated. <sig> <pubKey> <pubHashA> <pubKeyHash> OP_EQUALVERIFY OP_CHECKSIG Top stack item is hashed. <sig> <pubKey> <pubHashA> <pubKeyHash> OP_EQUALVERIFY OP_CHECKSIG Constant added. <sig> <pubKey> OP_CHECKSIG Equality is checked between the top two stack items. Generations have a single input, and this input has a "coinbase" parameter instead of a scriptSig. The data in "coinbase" can be anything; it isn't used. Bitcoin puts the current compact-format target and the arbitrary-precision "extraNonce" number there, which increments every time the Nonce field in the block header overflows. Outputs can be anything, but Bitcoin creates one exactly like an IP address transaction. The extranonce contributes to enlarge the domain for the proof of work function. Miners can easily modify nonce (4byte), timestamp and extranonce (2 to 100bytes). The output sets the conditions to release this bitcoin amount later. The sum of the output values of the first transaction is the value of the mined bitcoins for the block plus possible transactions fees of the other transactions in the block. Ultima editare a paginii a fost efectuată la 18 mai 2013, ora 12:42. Conținutul este disponibil sub Creative Commons Attribution 3.0, exceptând cazurile în care se specifică altfel.